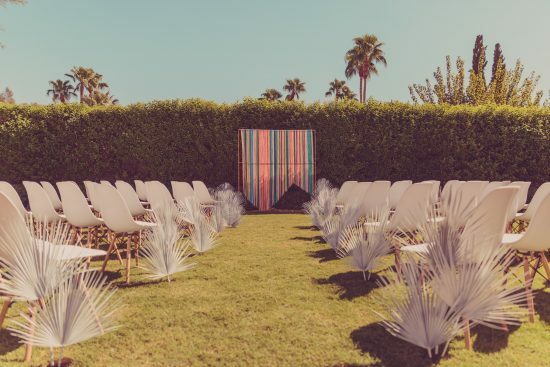 Thinking about Palm Springs for your destination wedding? Boy have you stumbled upon a treasure trove of amazing locations to choose from! Aside from the gorgeously landscaped and beautifully decorated hotels, there are numerous golf clubs with event space, and the best collection of estates for weddings in Southern California. Design aesthetics range from hipster, to mid-century modern, to ultra luxury, to classic desert, to Mediterranean, to Spanish style to historical buildings. (Now you see why Hollywood celebs love escaping to this desert wonderland!) No matter what style you are looking for, Palm Springs has the perfect location for you! Palm Springs has 360 days of sunshine each year. Not kidding! The way the desert floor is situated between the mountains, clouds from the coastal plan stay on one side, keeping gorgeous sunshine on the other. Our favorite seasons are Spring and Fall, as the days are not too hot and the nights are still warm. Having been wedding planners in the desert for over a decade, we’ve been able to create some of the most magical environments for our clients. While many people want to plan to go inside at night, we see the opposite happen with guests at weddings in Palm Springs. It is so nice outside they often don’t want to go in. Al Fresco dining is very popular as are late night lounges with acoustic guitars. The pace in the desert is slow…so it’s ok to slow down and enjoy your environment.